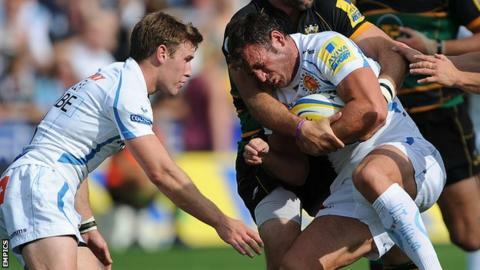 Exeter Chiefs have bought the Premiership shares of Leeds Carnegie for about £5m. The P shares, which will increase Exeter's income from the league by an extra 25%, were issued to the 13 established top-flight clubs in 2005. Exeter were entitled to buy shares from Leeds because they have been outside the league for more than a year. "When we get the money, it'll be a significant increase to our income," said chief executive Tony Rowe. Every club gets five A shares for every year they are in the Premiership. P shares, worth 25% of income, only given to 13 clubs. "It's taken many, many months of wrangling over whether we could have them or not," Rowe told BBC South West Sport. "It has been a struggle because we're competing against clubs who are getting the full income from the Premiership, but we're OK.
"Rob's [head coach Rob Baxter] not doing a bad job with the money we've got." Leeds plan to ring-fence all the money they receive from Exeter so they can buy back their P share if they return to the Premiership, having been relegated in 2011. "Without the share holding, it makes it extremely difficult to gain parity with the other teams in the Premiership and for our long term future we must retain the ability to buy back the P shares," said Leeds chief executive Gary Hetherington. "There is a mechanism in place that means there can only ever be 13 P share holders at any one time and only a team who has been in the Premiership for more than a year can make an offer to purchase those from a club who have been out of the Premiership for more than a year." Exeter are still at a disadvantage when it come to funding in terms of the other clubs in the Premiership. On promotion to the the league a team is given B shares and then five A shares for every year they are in the league, up to a maximum of 40. A team receives all 40 A shares when they have been in the league for six successive seasons. However, each season a side is out of the Premiership they lose five A shares. Rowe is unhappy that a club promoted to the Premiership who has not been part of the top flight before, such as Exeter or London Welsh, are not given the same money as the other clubs in the league. "I think it's wrong, at the end of the day we have to give 100% of the advertising space to the Premiership advertisers as part of the sponsorship deal but we were only getting, until we purchased the P shares, less than half the income of the other clubs," he said. "But you've got to take it on the chin, get in there and get on with it. "There's no use moaning about it, nothing's going to change, you've got to get in there, survive, and earn your right to have your shares."